While we’ve been experimenting with the aircraft we’ve also been tracking our cross country route across Saudi Arabia . On the SYSTEMS MFD we can see the moving map with terrain displayed and, superimposed on top, our route including our waypoints. 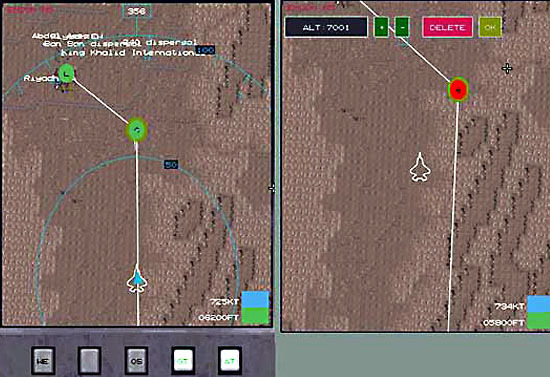 The pre-loaded waypoints can be adjusted at anytime in flight by hitting “WE” at the bottom of the MFD, opening the WAYPOINT EDITOR. Using the waypoint editor we can adjust waypoints, add, or delete them according to where we want to go. 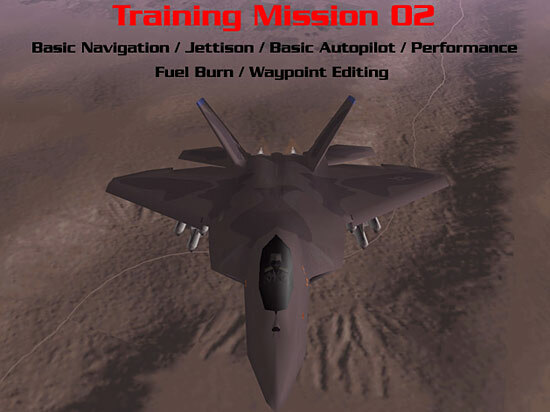 The F-22 Strategy Guide notes that you can only edit waypoints within 100 nm of your current location however. 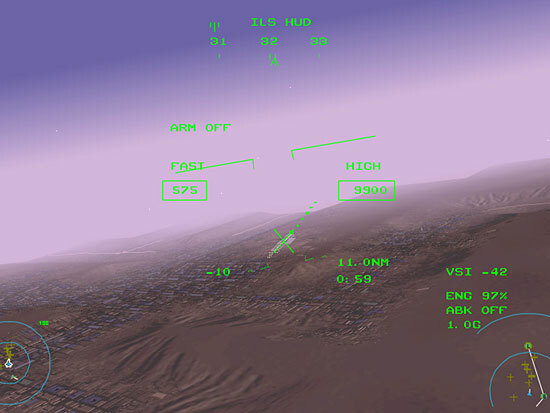 Clicking on a waypoint will allow you to change the altitude or delete it. You can also click on the waypoint and drag it to a new location. To add a new waypoint, click on the “+” key that lies at the midpoint between two waypoints. Reasons for wanting to modify waypoints are varied, but most often you would want to do it to possibly avoid SAM sites, dense enemy air activity, or built up areas. On the other hand, you may *want* to find these sites, so move the waypoints to fit your level of aggression or cowardice! 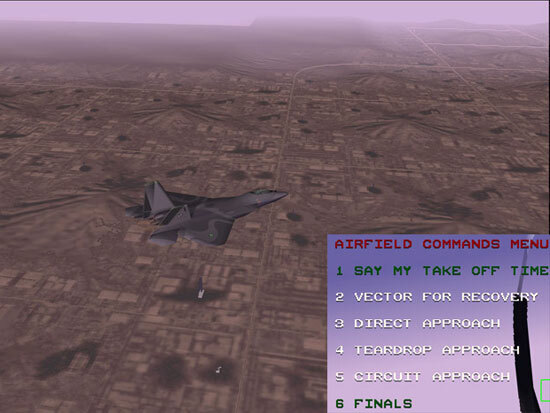 Approaching Riyadh it’s time to contact the tower for a landing clearance. Though we haven’t talked extensively about EMCON levels, you must be in at least EMCON Level 2 or above in order to communicate using your aircraft radios. The F-22 has four preset communications frequencies (PUSH-1, 2, 3, 4) that allow you to talk with other aircraft, airbases, and AWACS. PUSH 1 is the frequency used to communicate with airfields. The TAW Manual states that communications and landing light patterns with airfields will be available within 15 nm of the airport. 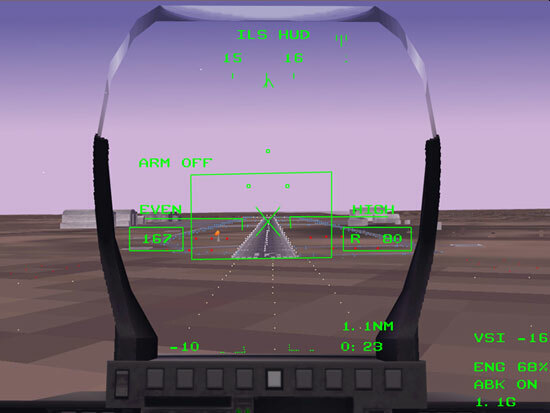 Start the arrival process by changing the HUD MODE to the ILS HUD so that the approach path to the active runway will be visible through your helmet display. 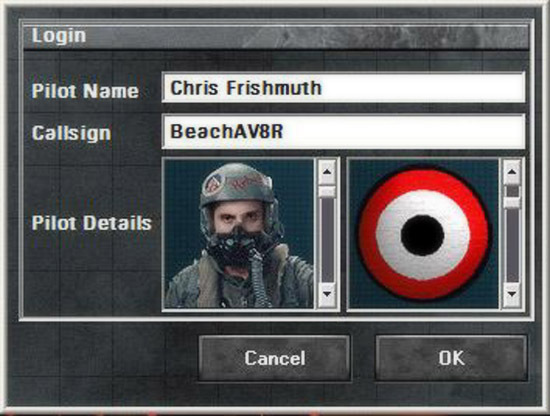 If you can’t find your airfield use PUSH 1 to ask for “VECTOR FOR RECOVERY” and the controller will issue a heading to fly to reach the airfield. There are 3 different types of approaches you can ask for once you’ve decided to land: direct, circuit, and teardrop. The circuit approach is the typical, most stabilized approach method that involves flying a normal pattern to landing. The teardrop is a bit of a truncated approach that involves a high-G turn to final that dissipates energy quickly and allows for a much faster approach and landing while remaining very close to the airfield (in case of enemy activity). Finally, the direct approach (the one I use most frequently) is a straight in approach with no maneuvering necessary except that which you feel you need to do to get lined up with the landing runway. No matter which type of recovery you choose, always remember to call the tower one last time on final approach to announce “FINALS” and receive your clearance to land. Traffic inbound and outbound from the airport may cause your request to land to be denied, so be ready for that. Landing is straightforward and I won’t go into excruciating detail. Shoot for 170 knots @ about 57% power and I find it helpful to keep the airbrake extended during the entire final approach segment. Make sure your gear is down (as verified by the 3 green dots in the ILS HUD) and make small corrections to fly through the green boxes.